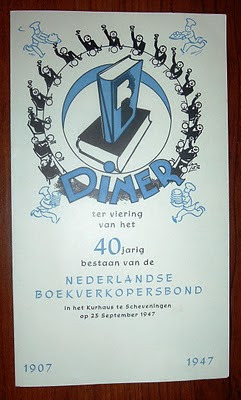 The Nederlandse Boekverkopersbond is the Dutch Booksellers Association. 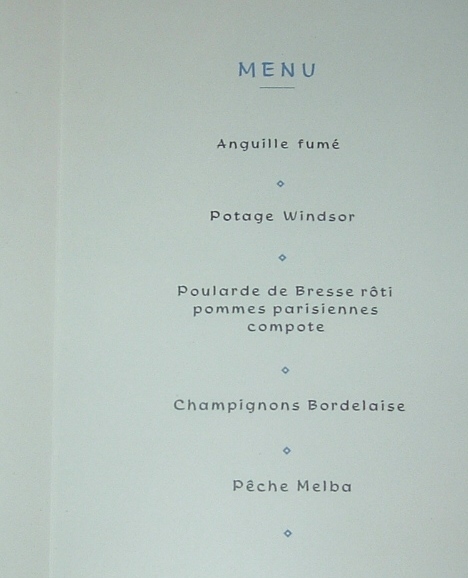 The graphic above is taken from the menu (below) of a dinner they held in 1947, celebrating 40 years as an organization. The association is still going strong and celebrated their centennial in 2007, for which I found a YouTube tribute. I see from their Web site, as well as the video, that a representative from the roundtable of cartoonish characters in the menu graphic continues in the logo today for the association. 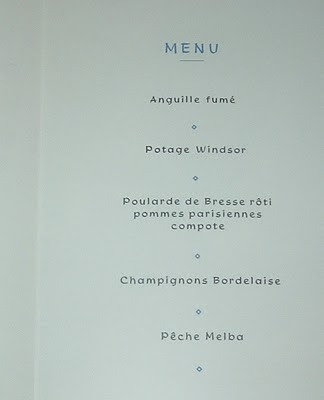 And, of course, the signature dish of any organization's dinner meeting was served... Chicken. Even sixty-something years ago. It just sounds a whole lot better as Poularde de Bressi. 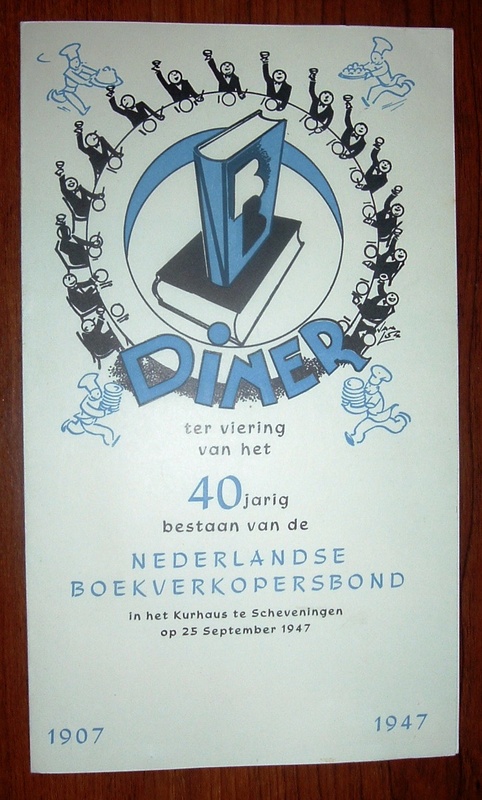 Dinner celebrations aside, the Dutch Booksellers Association plays a major role in the Netherlands along with the Groep Algemene Uitgevers (Trade Publishing Group) promoting book reading and book buying in their country. 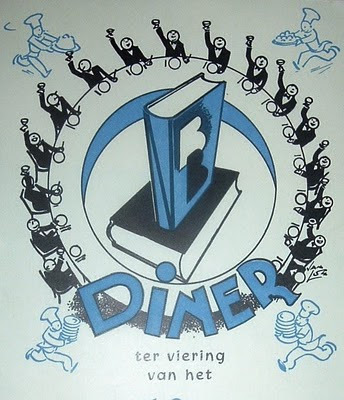 These two groups teamed up in 1983 to form the CPNB, which is an acronym for (in English) Collective Promotion for the Dutch Book. The first paragraph from their Web site is worth quoting here, not only for the numbers that attest to the collaboration's success, but also for their blending of idealistic and commercially-driven goals of reading books and buying those books from local book shops. I am particularly biased toward the idea of supporting the booksellers! About 40 million trade books are sold in the Netherlands each year with a total turnover of some 500 million Euros. Since 1930, Dutch publishers and booksellers have cooperated in promoting trade books; in 1983 this task was allotted to the CPNB (in Dutch: Collectieve Propaganda van het Nederlandse Boek), a foundation set up in Amsterdam. The CPNB aims to encourage the habits of book reading and book buying. Each CPNB campaign has its own mix of two strands, one idealistically promoting reading, the other, more commercially, encouraging the public to visit their local bookshop. A chariot driver and team of horses leap across the landscape (Manhattan?). Following that graphic, the title, Today's Books, jumps out at you on the cover of this little bookshop catalog. 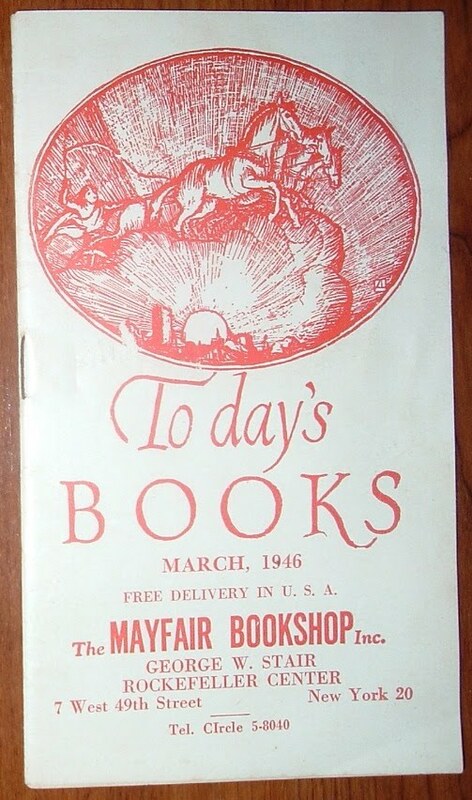 Today is March 1946 and Today's Books could be purchased at the Mayfair Bookshop, owned by George W. Stair in New York City at 7 West 49th Street--Rockefeller Center. Thumbing through the catalog for items of interest sixty-five years ago, an ad for this book caught my eye: The Story of the Stars and Stripes: A Paper for Joe, by Bud Hutton and Andy Rooney. Yes, that Andy Rooney--the 60 Minutes journalist and author. You could also call him an ex-college football player (Colgate University) and a World War II veteran. And he was already a veteran author in 1946, having written his first book while serving in Europe in 1944. Rooney was drafted into the Army in 1941. 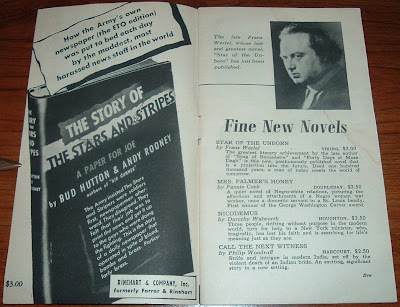 In 1942 he began reporting for the military newspaper The Stars and Stripes in London. The following year, 1943, he and five other correspondents flew with the Eighth Air Force on the first American bombing raid over Germany. Rooney's first book (also co-authored) was Air Gunner (Farrar & Rinehart, 1944), about his observations of the Eighth Air Force during his time with them. Rooney went to work for CBS in 1949 and did a tremendous amount of writing for them in the form of essays, scripts and series. I can't find another book he published until 1981's bestseller, A Few Minutes with Andy Rooney (Atheneum, 1981), which launched a run of some 15 books to date. 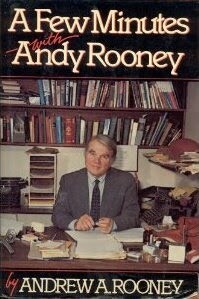 These are the books we associate today with Andy Rooney. But during and immediately following World War II, a young pacifist turned soldier cut his journalistic teeth and parlayed his wartime reporting experiences into his first two books. 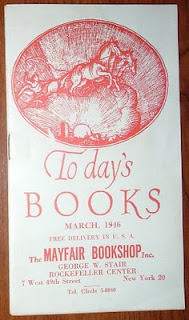 You could probably find both of them at the Mayfair Bookshop in Manhattan back in 1946. And by the way, that young soldier/author is 92 years old today. I received my quarterly issue of Ephemera News (a publication of the Ephemera Society of America) yesterday and one article in particular got my attention: The Appeal of a Fan, by Moira F. Harris. She writes about a hand fan she purchased at an estate sale and muses on the various reasons one might collect such a fan. There are collectors of hand fans and collectors of ephemera, including hand fans, with connections to various themes of interest, such as images, advertisements, or locales to name some. This article reminded me of a hand fan I have in my collection of ephemera related to book-related businesses. I don't collect hand fans, but this one found its way into my bibliophemera collection for the obvious reason of its connection to an old book store. The City Book Store in the city of Wooster, state unnamed, sold or gave these fans away probably around the turn of the century (19th to 20th) judging by the photo of the little girl and her books on one side of the fan. The other side features information about the book store and its various products. You could find more than just books at City Book Store, which I'm reasonably certain is in Wooster, Ohio (the only Wooster I can find). 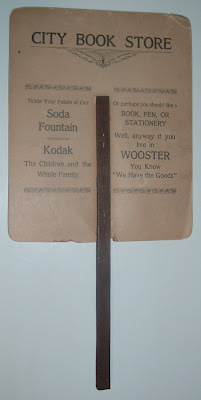 Pens and stationery have long been associated with book store inventory, but the soda fountain and Kodak seem to run a bit outside the typical attractions. However, the ads for these commodities help date this book store fan. Soda fountains have been around since the late 1800s and their heyday was in the early decades of the twentieth century. 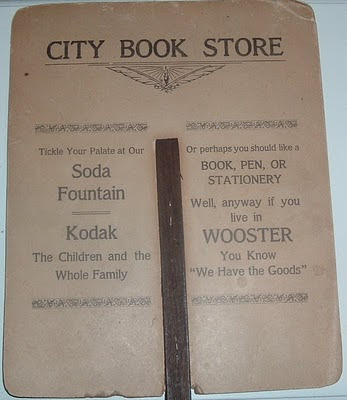 They are usually associated with drug stores, but the City Book Store in Wooster advertised one in its establishment. It brought popular, personal photography to the masses by enabling everyone--even a child--to become his or her own image-maker. To promote amateur photography, Eastman Kodak marketed its invention as a toy. While production figures increased each year during the 1890s, it was the Brownie camera of 1900, marketed explicitly to children and their parents, that accelerated and assured the democratization of photography. 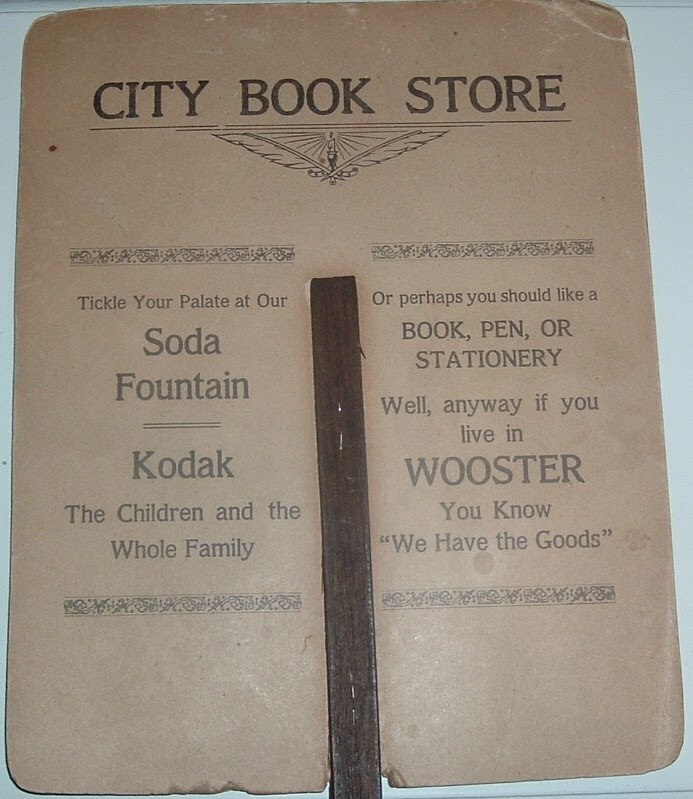 Perhaps the Kodak on the City Book Store fan was a Brownie, as the slogan might suggest. The book store appears to have taken a page out of the Eastman Kodak marketing book with the advertising slogan "The Children and the Whole Family." I guess this book store in Wooster did its part for the "democratization of photography." Other than a place in the store's name, and being lumped in with pens and stationery, books in the City Book Store appear to be lacking in prominence against the competition of popular culture of the day. More than a hundred years later, they're still battling popular culture for acceptance, but they continue to hang in there and thrive. Maybe. Maybe not. And why Leipzig? 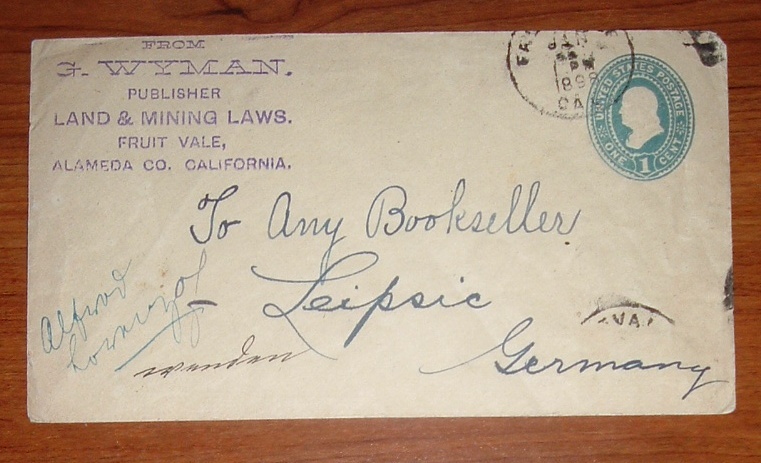 More than a hundred years ago, 1898 to be exact, California publisher Gilbert Wyman, of Fruit Vale (Fruitvale) in Alameda County, sent a letter addressed simply To Any Bookseller in Leipsic (sic) Germany. 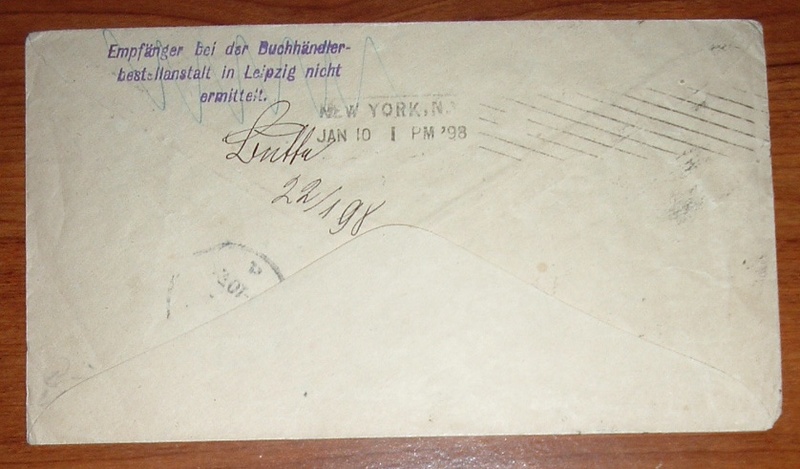 The cover, with 1898 postmark, is shown below. I can find only one book published by G. Wyman: Public Land and Mining Laws of Alaska, The Northwest Territory, and the Province of British Columbia, compiled by Wyman, and it was published in 1898, the year this letter went out in search of any bookseller who might be interested in stocking a few copies of, presumably, this book. Wyman was an attorney, according to an 1897 copy of California Attorneys Directory. Perhaps as a publisher, Wyman was a "one hit wonder" with regards to actually getting a book into print. And "hit" may be stretching it quite a bit with this title. I would assume Wyman had a limited market for this book on mining laws in the northwest region of the North American continent. Maybe not, though--the Alaska gold rush was on by 1898. Apparently, Wyman sought to expand that market overseas. A simple strategy unfolds as I examine this empty envelope: Prepare a form letter advertising the book, send it to Any Bookseller in a selected city, or cities, in the world, and hope the postmaster makes a good selection for you. Or any selection. Whether there were other cities in this marketing strategy, I'll never know, but this letter did find its way to Leipzig, as evidenced by a German language stamp on the back of the envelope: Empfänger bei dar Buchhändler best-Nanstalt in Leipzig nicht ermittelt. Under that is a name and what looks like the date 22/198 (22 January 1898?). I'm not certain of the translation, but, keying on a few words, I believe it has something to do with a bookseller's receipt of the letter not being determined. What that means exactly, I'm not entirely sure. 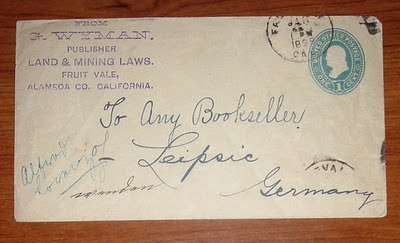 But did Wyman's letter ever land in the hands of a bookseller in Leipzig? 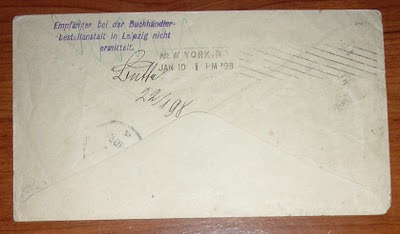 Perhaps the Post Office in Leipzig could not make the determination as to which bookseller should receive the letter. Perhaps it was forwarded to an agency of some sort that dealt with booksellers for them to make the determination. Whatever the case, the letter does not appear to have been returned to Wyman back in California. At least there are no indicators of such action on the envelope anywhere. 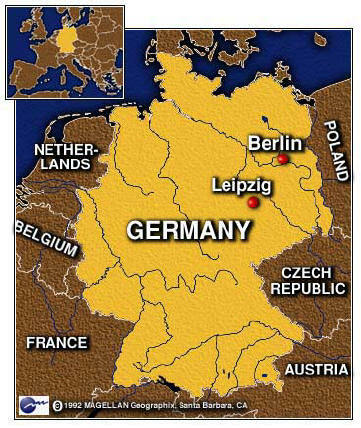 Why Leipzig of all the cities in the world in which Wyman could have peddled his book? And why would the postmaster in Leipzig have a stamp for letters not addressed to a specific bookseller? Map found at Finswimmer Magazine online. An excerpt from the Official Directory of the German Book Trade , 1906 (close enough to Wyman's posted letter), as reported in The Publishers' Circular and Booksellers' Record, Volume 84, speaks to why Wyman may have chosen this German city to sell his book and perhaps garner interest in North America's northwest gold mining country. It may not be generally known that in Germany bookshops, as well as publishing houses, are not limited to the principal towns but are scattered all over the empire, and often found in very small places; to order all the books direct would be too expensive, thus the supply has to be specially organised. The centre of the book trade in general is Leipzig; of 2,994 principal German publishers 2,886 keep stock there. Every publisher and every bookseller has an agent in this town with whom all business transactions are carried out. Booksellers, as a rule, send their orders to their agent in Leipzig, who transfers them to the corresponding publishers' agents in that city. The books, which otherwise would have to be posted direct in as many small parcels, are thus collected in Leipzig and sent to the different booksellers in one lot. As already stated, the centre for the universal book trade is Leipzig, but in order to facilitate and accelerate business many publishers keep stock in other transit places and trade centres as well. According to the statistics in the new directory there are 10 booksellers' agencies in Berlin, 18 in Budapest, 117 in Leipzig, 5 in Prague, 11 in Stuttgart, 30 in Vienna, and 6 in Zurich. Some other figures may be of interest as well. Germany contains 348 publishing houses devoted solely to art publications, and 419 to music ; 147 shops specialise in the sale of new books, and 515 in the sale of music; 224 sell only second-hand books, the number of second-hand dealers who sell other books as well amounts to 1,640. There are 1,078 lending libraries conducted by booksellers, and 396 reading clubs. The number of booksellers who also sell objects of art, or music, or have a lending library &c. of any kind, or are also publishers, amounts to 6,600. The directory, which is published every year, is drawn up in a clear and concise manner, and the methods by which it is kept up to date are very interesting and practical. The first part, the directory proper, contains the name of the firm, of its owner, and the date on which he took possession, also the postal and telegraphic addresses. It further gives the names of his agents in the different towns, and generally, in the case of a publisher, his business rules and terms, or, if a bookseller, the conditions upon which he accepts new books on sale. It states besides whether he is a member of the Borsenverein, the chief association, and how far he acknowledges the trade rules for new or secondhand books &c.
The numbers tell quite a story. Leipzig was indeed the "universal centre" of the book trade, at least in Europe. Back in California, Wyman probably knew all this. Thus, his letter to Any Bookseller in Leipzig. But the rules cited in the directory extract above indicate a well regulated industry, one in which the Post Office could not call the shots on forwarding Wyman's letter. By the 18th century, Leipzig had even become the center for trade with Polish and English goods and was known as 'the marketplace of all Europe'... Leipzig became the main German fair for books and consumer-goods. A technical fairground was opened in 1920 and by 1930 it drew visitors and exhibitors from 45 countries. By 1940, the fair included 19 more pavilions. Throughout the centuries, a whole book district developed in Leipzig complete with book museums. The Leipzig fair, which had occurred twice a year for seven centuries, was mostly destroyed by Allied bombs in World War Two along with an estimated 50,000 books, many of them rare, from the historic book district. Not having studied in depth the history of the German book trade, I can only speculate on the factors involved in Wyman's very casual solicitation of his book. What I deduce from all this is that Wyman knew of Leipzig's reputation as a publishing and bookselling hub in Europe and with an overwhelming number of booksellers in that city his Any Bookseller address was sure to find a sales outlet in the old country. And with the Klondike Gold Rush in full swing, the lure of gold would create an interest in his book about the associated land and mining laws. What Wyman may not have known or fully appreciated was the highly structured organization of the book trade in Leipzig. But the letter appears to have found its way to a bookseller whose name appears on the front of the envelope. 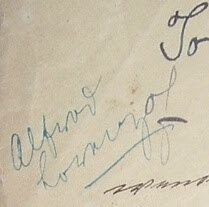 At first, I thought this name was Alfred Lorenz, but I cant find a Leipzig bookseller by that name. In German-Austrian music circles, yes, but not in a Leipzig book shop. Trying a variety of spellings, I happened upon Alfred Lorentz, with a "t," who was a bookseller in Leipzig. That great resource, Seven Roads Gallery of Book Trade Labels had one of Lorentz's bookseller labels. Of course. I should always know to look there first. I can only assume that someone in the chain of command from the Post Office to trade association to publisher to bookseller agent (or some variance thereof) thought of Lorentz, but misspelled his name. Must have been thinking of the musical Alfred. Nonetheless, Alfred Lorentz probably got to read a letter from a California lawyer who had published a book he wanted to sell to any bookseller of Leipzig. I wonder how many copies Alfred ordered?